For Name Tapes and Rank Tapes, contact 1800NAMETAPE.com, the Leader in Name Tapes, Rank Tapes, and Military Insignias. NWU3 Limited Edition Scrub Hat with Cargo Stash Pocket. NURSEJOE'S Arid Desert Headwrap has a mini pocket on the back flap for your stash. Made with authentic U.S. military grade fabric and high quality construction. Limited Edition. NurseJoe's Drone Force Headwrap with Stash Pocket on the back flap is a innovative design that is shaking up the industry. Comfort fitting for healthcare or everyday cruising. One Size Fits All. NurseJoe's Land Sea & Air Scrub Hat is a Limited Edition Head Wrap worn by nurses, surgeons, doctors, bikers, and hikers. Made in the USA with authentic military grade fabrics. Our New OCP Scrub Hat is designed with authentic military grade fabric and high quality stitching. The cargo pocket is just a bonus. 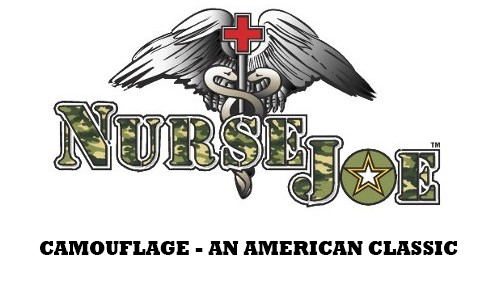 NurseJoe's Snow Chip Scrub Hat is designed with authentic military grade fabric and high quality stitching. The cargo pocket is just a bonus.